Hello! I have a 2 questions about fishing. 1st one: How to catch those bigger fish that are deeper? I don't get it? Do you have to have special skills? 2nd one: Is it possible to collect all fish collectibles? Or now it's just for us to see, but you will be able to collect them in the future? To answer your first question. To catch those that are deeper you need to up grade your rod when you level up like a new rod at level 5,10,and 15 I believe. If you have basic access you cannot get to those on the very bottom. For your second question. 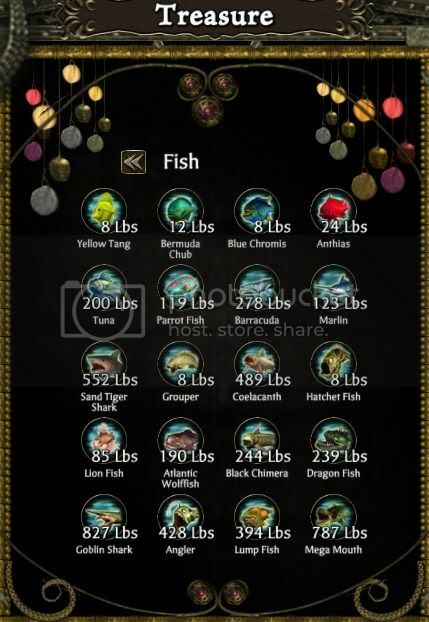 I think your trying to say if we will use the fish we find for quest, if thats the case, I'm not sure. Hope this helps! Oh and with collectibles I meant treasure. I meant how do you collect all fish treasure, because all I see is 5 fish swimming? Are the other fish deeper? Like much deeper? But thank you very much! There are different types of fish that are deeper, which you can only access with an upgraded rod (unlocked at levels 5 and 15). These allow you to cast farther and sink your lure deeper. Also, there are a wider variety of fish in the ocean, so you should launch a fishing boat (unlockable at level 10) to catch those other ones. Ok! Thank you all very much! You, guys, answered all of my questions.